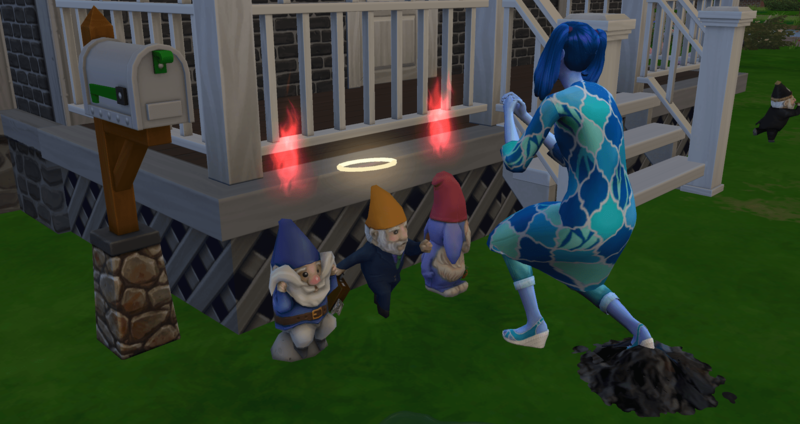 Xia’s first holiday is St. Gnome’s Day. 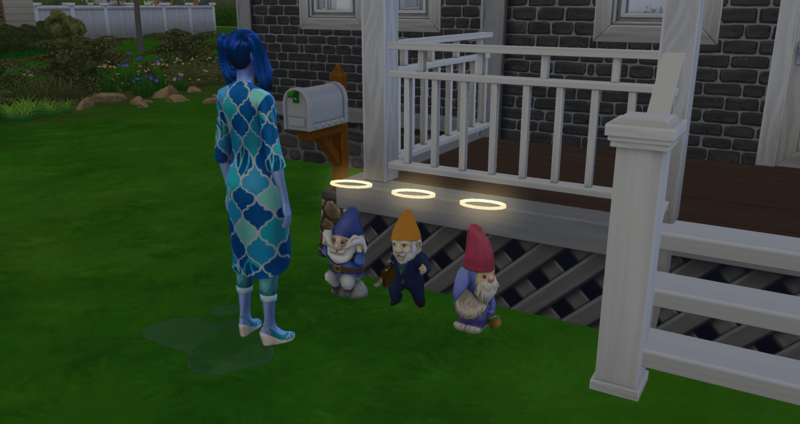 She wakes up to find three new gnomes have magically appeared in her house. She moves them to a more convenient location and attempts to appease them. She doesn’t have a good success rate initially. She begins her round of begging for forgiveness. 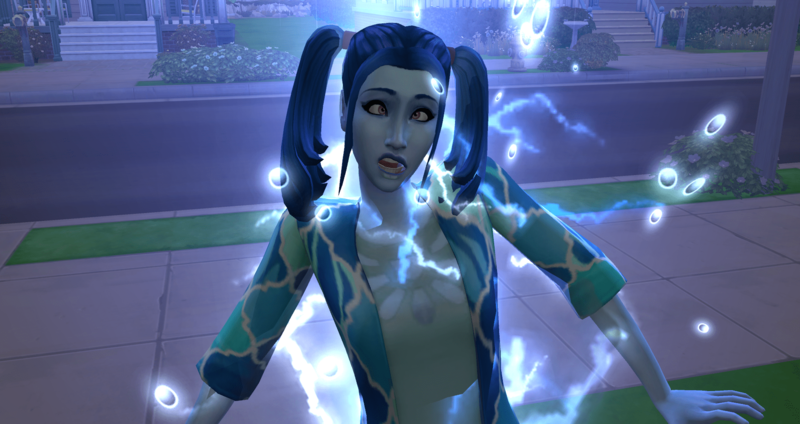 Thankfully the lightning doesn’t leave her with a shocked moodlet so she can continue to beg as it takes hours of begging to finally earn their forgiveness. Hours, it takes many hours – but it is finally done. No puddles and trash will be left in this house today. Only packets of seeds, lots and lots of packets of seeds. Since her fun has been tanked again, it is time for a visit from Don. Afterwards, she keeps him captive and practices her funny on him. 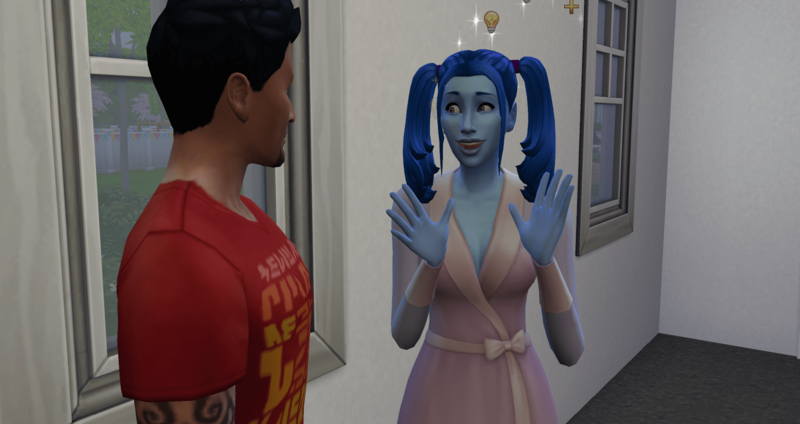 She needs to get to level 6 and he has been trying to leave since they left the bedroom, but she keeps calling him back for one more joke. Just one more. She even gives him a funny gift which he did think was funny. Corny, but funny. And she finally got dressed. 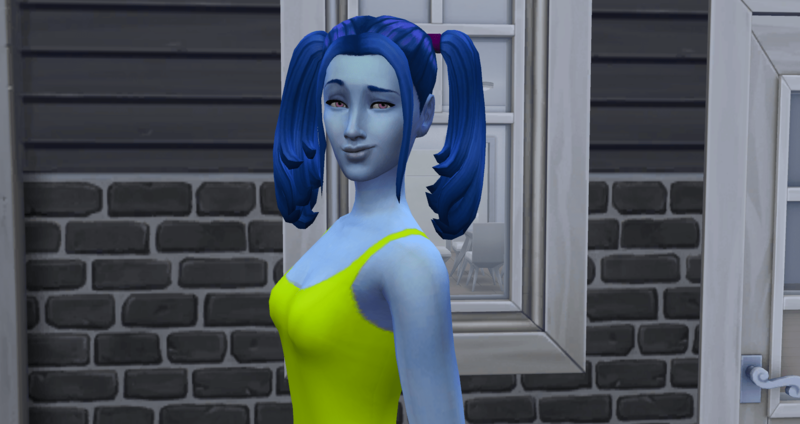 When I created her I actually took the time to give her five oufits in every category, so she has a variety of looks. Finally she lets him leave and heads to bed – alone to sleep. Once the holiday is over, the gnomes will become dormant, which means I can sell the ones that don’t belong here and move Gnomingo back to the front where he belongs. Which also means money for her pocket. She collects all of the seed packets they leave, which is more money for her pocket. She might actually get some furniture for the house. The next day she has the next holiday – one of the surprise holidays. Friday is Night on the Town. She has to work at 5pm so she is going out early in the day. She invites Don to go with her and that tradition was quickly satisfied. They don’t even get any food, they just show up and it is done. After cheering, they order their free coffee and have a pleasant drink. 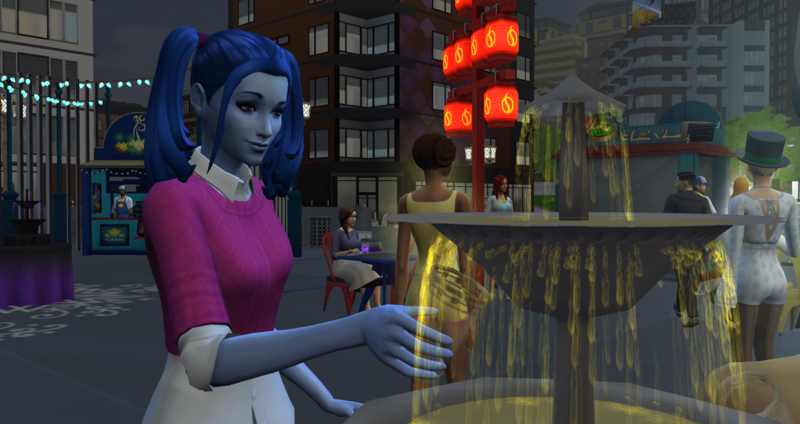 Since she is already out, I decide to send her to the city to check out one of the food stalls and see if she can work on learning the recipes. And I found a benefit to the Night on the Town holiday – all food is free, which is good because she still doesn’t have any money. Xia orders one of each of the foods at the first food stall and attempts to eat all three. Of course, this was a spicy food stall. 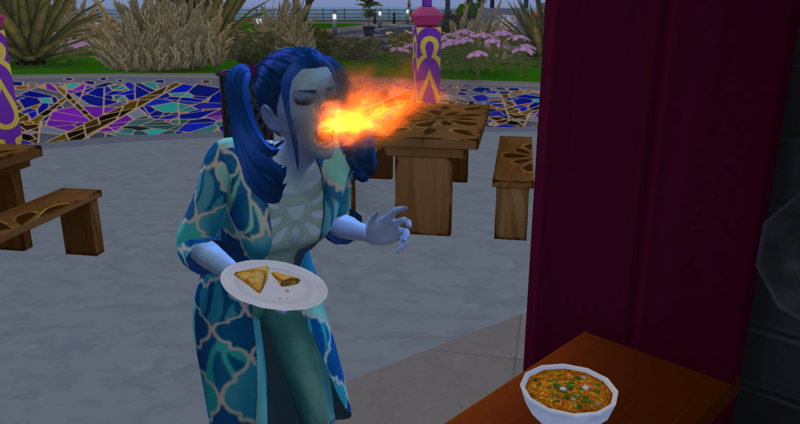 She did eat all three dishes and was able to check them off of the list. And now, that is a much happier promotion face. Xia is now a C-Lister – level 3. Notice Gnomingo is back on duty after his day of celebration. We have finally made it to the end of the first week. That seemed like it took forever. Xia has started the family garden. I wasn’t going to start the garden so early, but there it is. Now it has to be kept alive. The trees are to the right and then there is everything else. 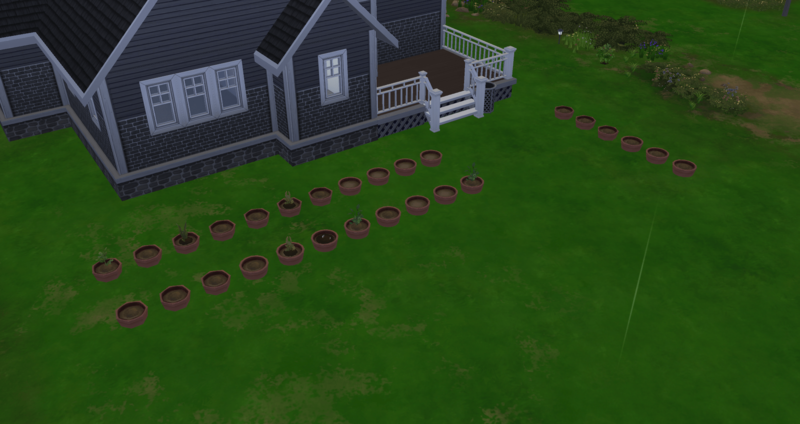 In case you are curious, there will be a list later of what has been planted. Yes, of course there will be a list. I live and die by my lists. 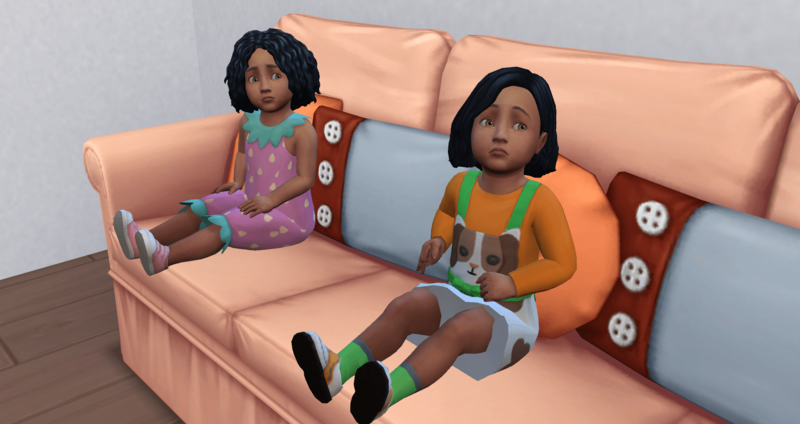 Xia was able to buy a kitchen table and a couch and then she bought the pots – I want to be able to take them inside so they don’t go dormant. At least that was my idea. Then I moved them outside. The result is Xia is broke again. And I can’t move the trees inside – maybe because of the foundation, or is it the roof? 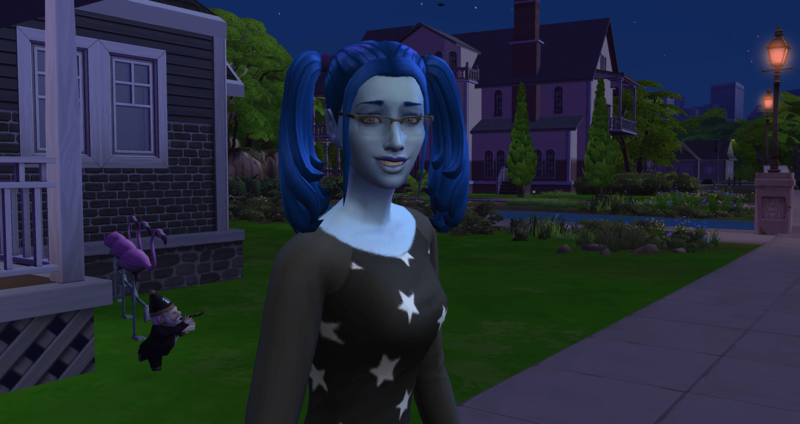 If so, Xia will build a greenhouse once she has some money, if she ever has some money to spare. 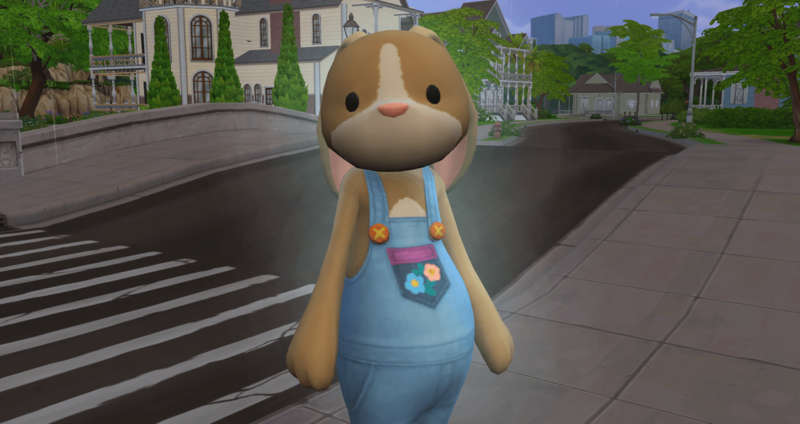 Plants Planted – because I needed the list – this is what is freaking me out – with the addition of so many new plants, this is overwhelming me with having to collect everything available and grow them all – I keep having to remind myself that Xia isn’t responsible for doing it all by herself. But everywhere she has gone, she has harvested and purchased anything available. 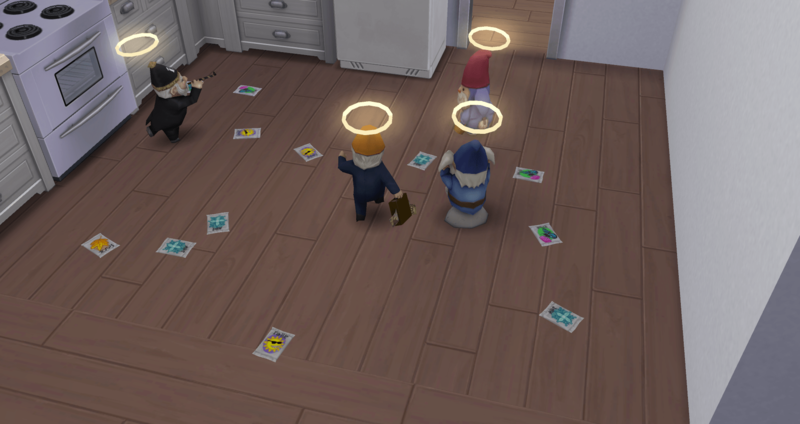 With the seed packets the gnomes dropped, she has made a good start. She has planted one and sold all of the extras, except for the strawberries – those she has kept in case she needs them as a snack during pregnancy. 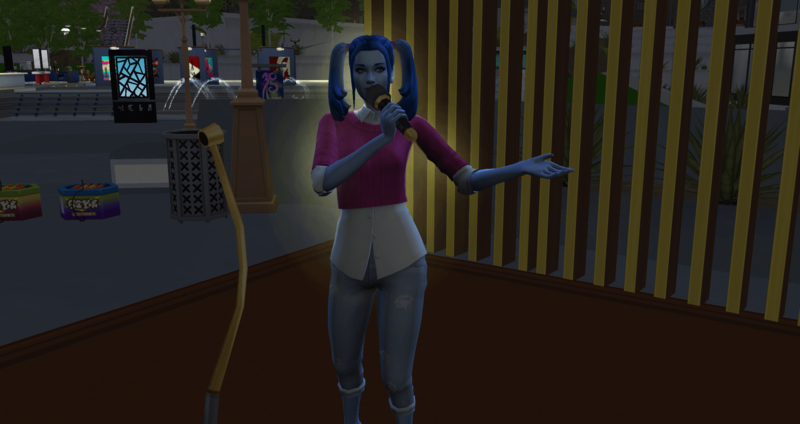 Xia missed two festivals in a row – the Romance festival because it took place while she was working and the Flea Market because it happened while she was working on the Spring Fling holiday. I think maybe twelve scheduled holidays is too many, even with 14-day seasons. It seems like she is always having one holiday or another. The Spring Fling is one of her holidays that she had to complete – and she is really glad she did. 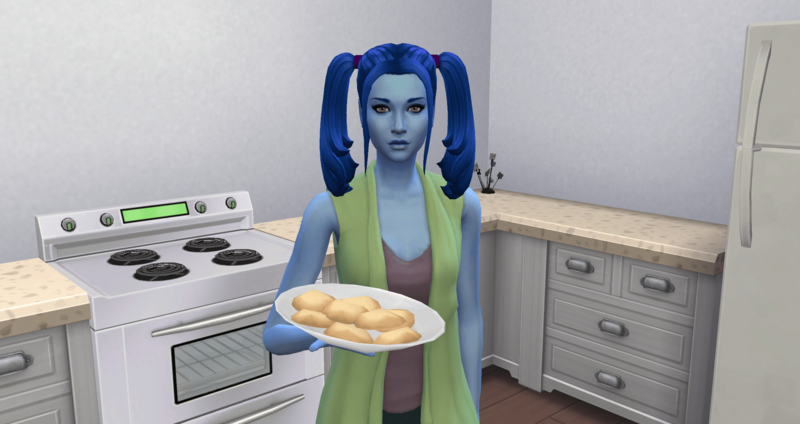 She baked cookies. She met the Flower Bunny. And they ate the cookies. 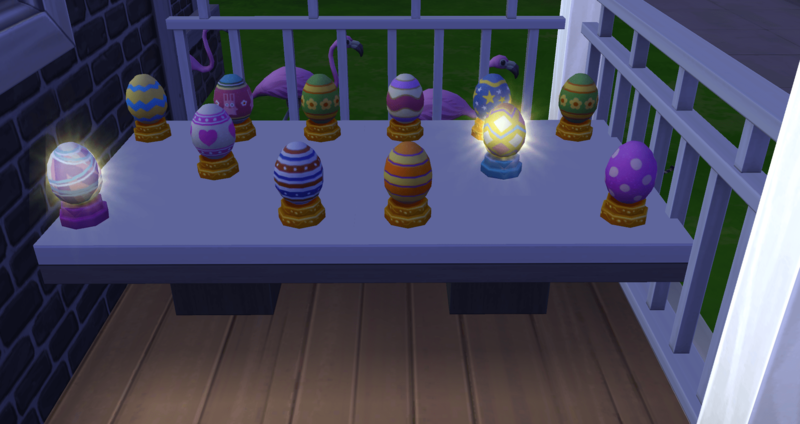 Then she went on an egg hunt around town and she found all but one of the Decorative Egg collection. She will have to wait until next year to complete the collection (I hope she is still alive – counts on my fingers – 8 weeks until is comes around again, 5-6 weeks until she is an elder, 3 weeks as an elder, holds my breath…) but assuming so, this will be her collection for the challenge. 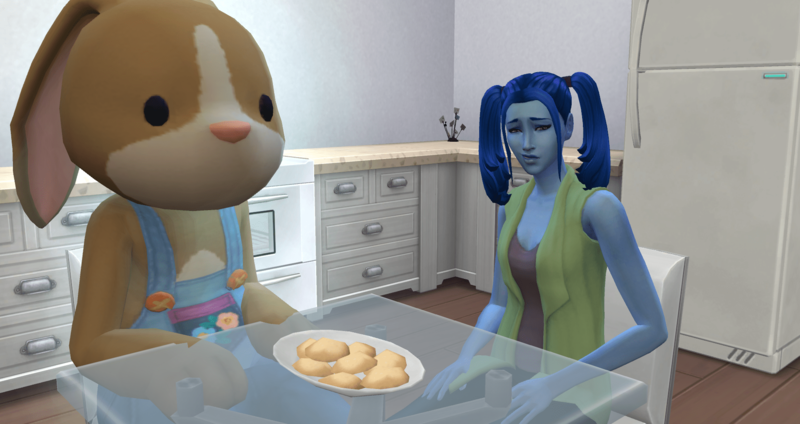 There are times I wish this would result in alien babies, but instead Xia just comes back tense from being probed. She takes a vacation day as she is exhausted and needs a day to recover. 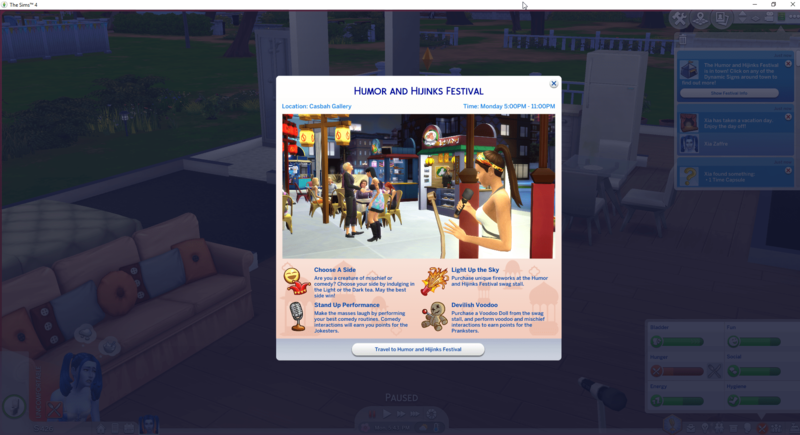 Just as she is feeling better, it is time to attend the Humor and Hijinks Festival. She chooses a side, performs some comedy, and plays with the sparkler. She is not able to purchase a voodoo doll as it costs too much money and she still needs to pay her bills. They are right at §400 and that is about what she has in the bank. She does get to try two more dishes from the food stall, bringing her up to 5/27. Which she promptly throws up. Hey, nothing says she has to keep the meal down, just that she has to eat it. 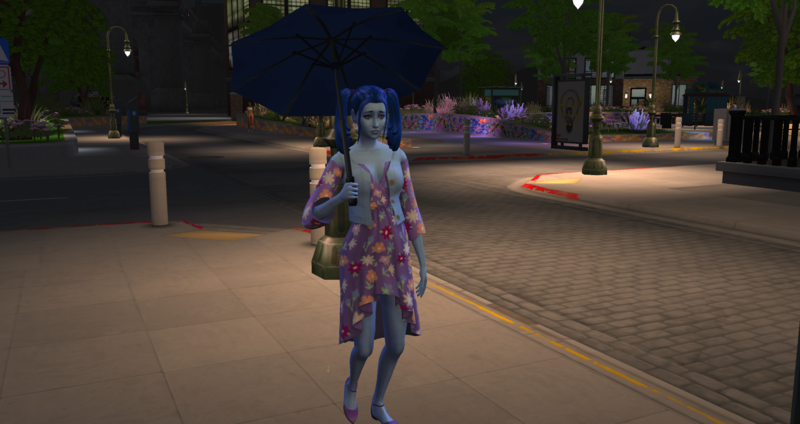 After a long, wet day in the city, Xia heads home and straight to bed. Exhausted but not hungry. Pregnancy brain in action. 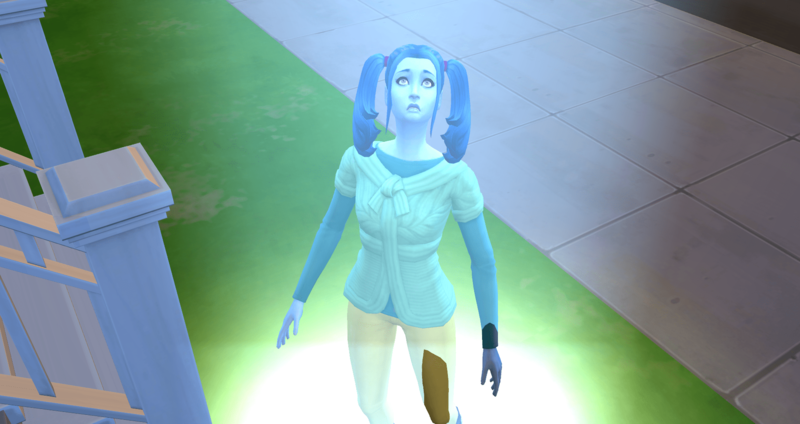 She stood there looking at her bed trying to figure out what was wrong. It took a moment to remember that she needed to put away the umbrella in order to get ready for bed. Xia begins three days of holidays, back to back in a row. Bleh. And she is pregnant, due any day. But, here we go. The first holiday is Love Day. Don calls up first thing and invites Xia out on a date, so off they go. Xia still is broke and she has sold all of the flowers she has grown, so she buys a cheap daisy to give to Don. He isn’t impressed. She isn’t impressed that he isn’t impressed. They move on to other things and Don greets his child and marvels at how big Xia has gotten. Soon the date is over and everyone goes home. Holiday has been successfully completed, now she just has to wait out the timer. But that isn’t everything for today. 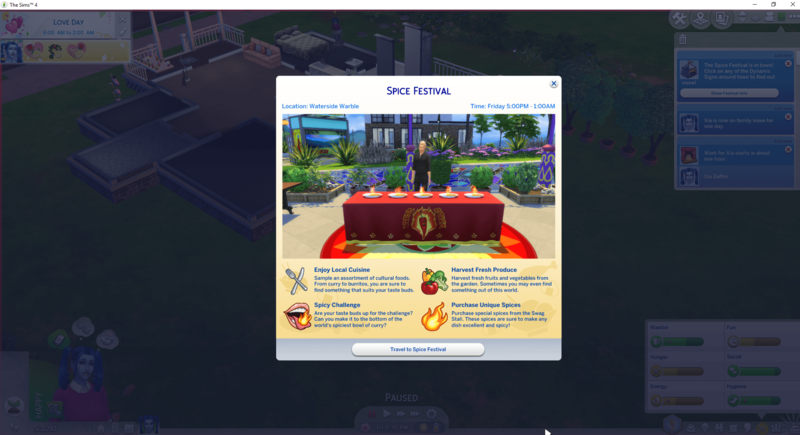 Once she gets home, the reminder for the Spice Festival pops up and she makes plans to attend. Or rather, the twins: Buffy and Bunny. I am not seeing any blue skin here. Her second day of holidays was the Neighborhood Brawl. Oh joy. 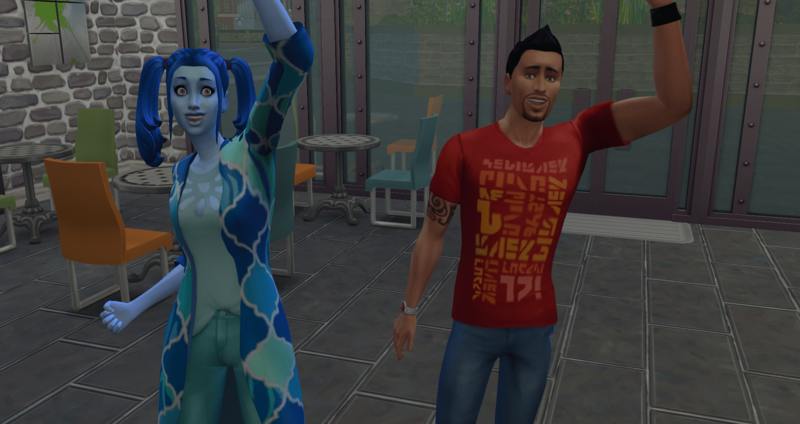 She invited over Jerkface because if she was going to tank a relationship, it was going to be with him. She had to fight him four times to get the holiday into gold status, but it didn’t tank their relationship – it improved it. Apparently during this holiday, fighting isn’t a negative activity, it is a positive one. Go figure. 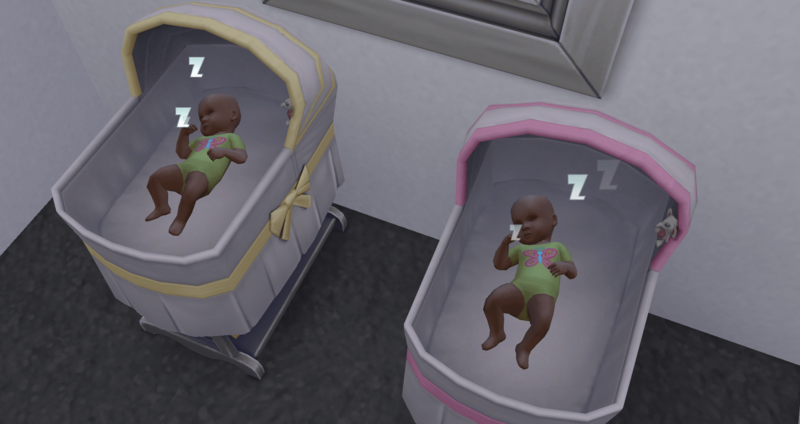 The twins become toddlers and here I will stop. I need to take a break and think about this. Buffy rolled wild (curly) and Bunny rolled silly (straight). 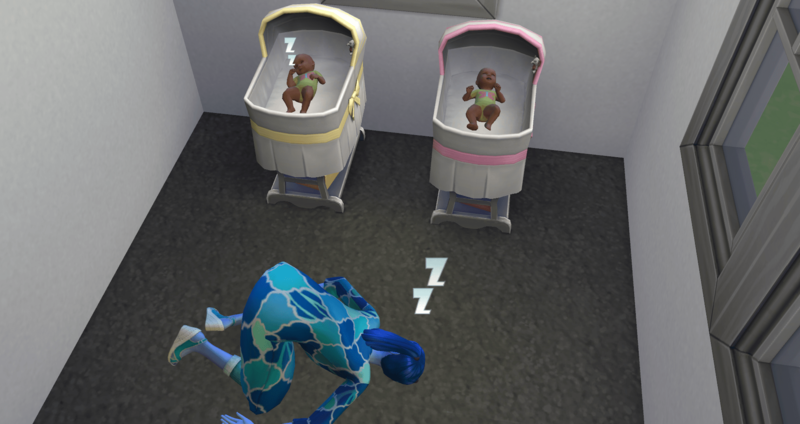 Neither inherited the blue skin, which is not a good thing. I need a girl with blue skin to carry on the line, to maintain the matriarchy.